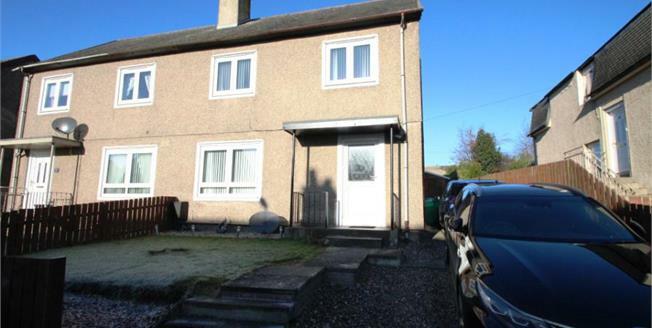 This semi-detached villa with off-street parking is located within the popular village of Kinglassie and is conveniently located for local amenities including primary schooling, with the towns of Glenrothes and Kirkcaldy within good commuting distance. The property is beautifully presented throughout and offers attractive accommodation over two levels. Access is via a upvc door into a welcoming entrance hall with storage/cloak cupboard. A glazed door leads in to the front facing lounge with French doors through to the dining kitchen. The dining kitchen is rear facing with external access door and is fitted with a range of modern high gloss units with integral 5 burner gas hob, double oven, extractor hood, microwave, slim line dishwasher and washing machine. There is further space for a free standing American style fridge freezer and for dining furniture. The modern shower room is located on the ground floor and fitted with cabinets incorporating a white low level wc, in set basin and quadrant shower cabinet with wet wall and mains shower. There is a useful storage cupboard on the upper floor landing and 3 double bedrooms. Externally, there are gardens to front laid to lawn with paved/chipped off-street parking for 2-3 vehicles to the side of property leading to the rear garden and a timber garage. The rear garden is sizeable and split in to two sections. One section is laid mainly to lawn with the other chipped with a timber deck area and timber summer house.